Situated 100 metres from Barcelona’s popular Born district, Pensión Palacio offers a 24-hour reception and colourful rooms with flat-screen TV and free Wi-Fi. Barceloneta Beach is a 10-minute walk away. Each bright room at the Palacio Guest House has a fan, a safe and a wash basin. 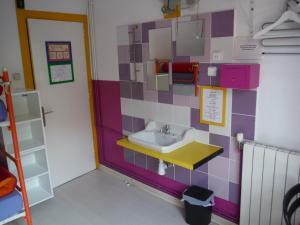 Some rooms also have a private bathroom. Towels and sheets can be rented from reception. 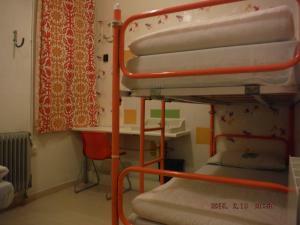 Pensión Palacio has a communal kitchen area with a fridge, microwave and crockery. Guests can use this to prepare snacks, but cooking is not possible. You can also try local cuisine in the many nearby tapas bars and seafood restaurants. 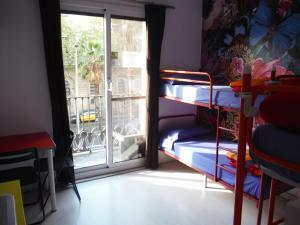 The Palacio is 350 metres from the Picasso Museum, while Barcelona Cathedral is 600 metres away. Barceloneta Metro Station and Port Vell Harbour are within a 2-minute walk. 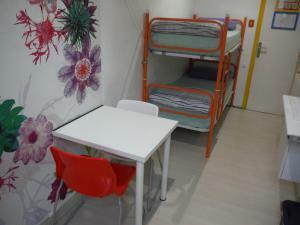 Please note that towels and bed linen are not included but can be rented for an extra charge. € 2 per person, per day for towels. 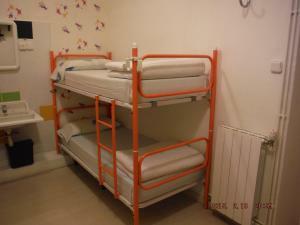 € 1 per person, per day for bed linen including pillow, sheets and blanket. Please note that the deposit for the first night is charged upon booking and is non-refundable. 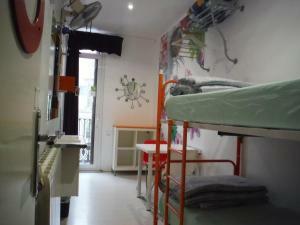 This bright and quiet, heated room includes bunk beds for 2 poeple and a balcony overlooking the street. It comes with a safe, a sink with mirror and a wall fan. Free Wi-Fi is included and the bathroom is shared. Towels and linen can be rented for an extra charge. 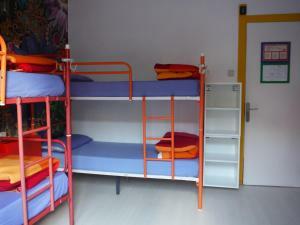 Rate: € 45.00 ... € 165.50; select dates below to get current rates. 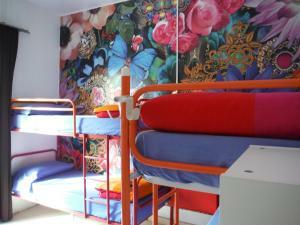 This colourful room includes a living area with sofa bed and a double bed. 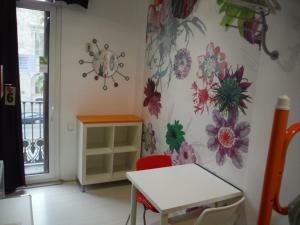 It has a spacious furnished balcony overlooking the street. 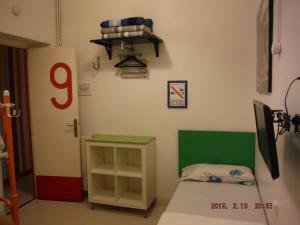 It includes a plasma-screen TV, a safe, a wall fan and free Wi-Fi. 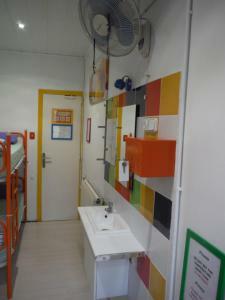 The private bathroom offers toiletries, towels and linen can be rented for an extra fee. This bright and quiet, heated room includes 1 double bed and a window overlooking an inner courtyard. It comes with a safe, a sink with mirror and a clothes drier. Free Wi-Fi is included and the bathroom is shared. Towels and linen can be rented for an extra charge. 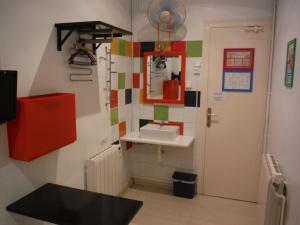 This bright and quiet, heated room includes 2 bunk beds and a furnished balcony overlooking the boulevard. It comes with a safe, a sink with mirror and a clothes drier. Free Wi-Fi is included and the bathroom is shared. Towels and linen can be rented for an extra charge. 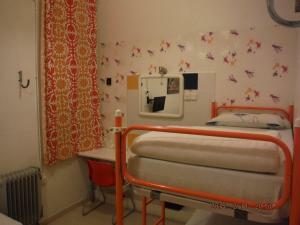 This bright and quiet, heated room includes bunk beds, 1 single bed and a window overlooking an interior courtyard. It comes with a safe and a sink with mirror. Free Wi-Fi is included and the bathroom is shared. Towels and linen can be rented for an extra charge. 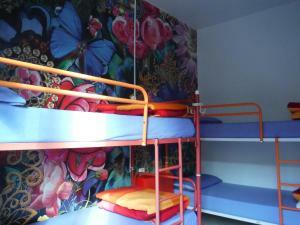 This small but colourful room includes 1 double bed and a window overlooking the interior courtyard. It comes with a safe, a plasma-screen TV and a sink with mirror. Free Wi-Fi is included and the bathroom is shared. Towels and linen can be rented for an extra charge. 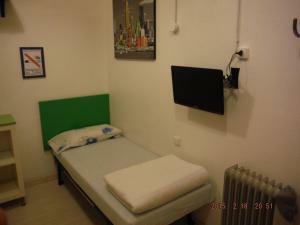 Rate: € 40.67 ... € 72.00; select dates below to get current rates. This small but bright, heated room includes 1 single bed and a window overlooking an interior courtyard. 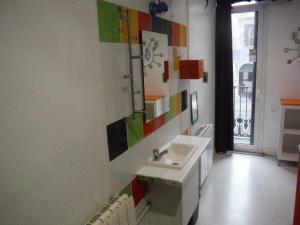 It comes with a plasma TV, safe, a sink with mirror and a wall fan. Free Wi-Fi is included and the bathroom is shared. Towels and linen can be rented for an extra charge. Rate: € 25.00 ... € 48.00; select dates below to get current rates. 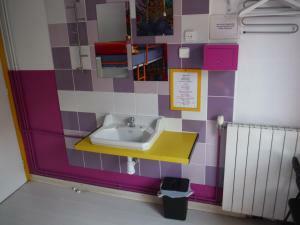 This small but colourful, heated room includes a window overlooking the interior courtyard. 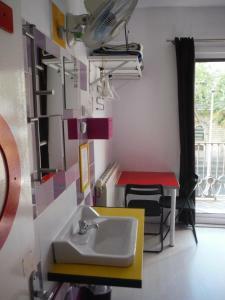 It comes with bunk beds for 2 people, a safe, a plasma-screen TV and a sink with mirror. 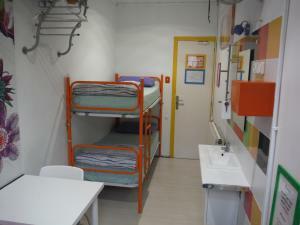 Free Wi-Fi is included and the bathroom is shared. Towels and linen can be rented for an extra charge. 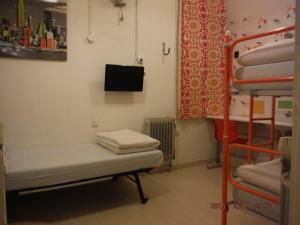 Rate: € 36.00 ... € 72.00; select dates below to get current rates.